Posted February 1, 2018 by The Rapid & filed under Places to Go. Movies, shopping and boat and auto shows! Explore Grand Rapids and beyond this month by riding The Rapid to get to a wide variety of family-friendly, low-cost or free events. Visit DeVos Place to discover what drives you! From Feb. 1 – 4, car manufacturers from around the world will bring their finest traveling displays with new vehicles – including sedans, vans, SUV’s, trucks, hybrids and sports cars. Not only is the Michigan International Auto Show a great place to shop and compare options for everyday vehicles, it is also the first opportunity for West Michigan residents to see many of the most recently released or soon-to-be-released models. This event is presented by the Grand Rapids New Car Dealers Association. Admission is $12 for adults, $5 for children 6-14 and free for children 5 and under. Purchase your tickets here. Beat the cold and tackle some shopping! 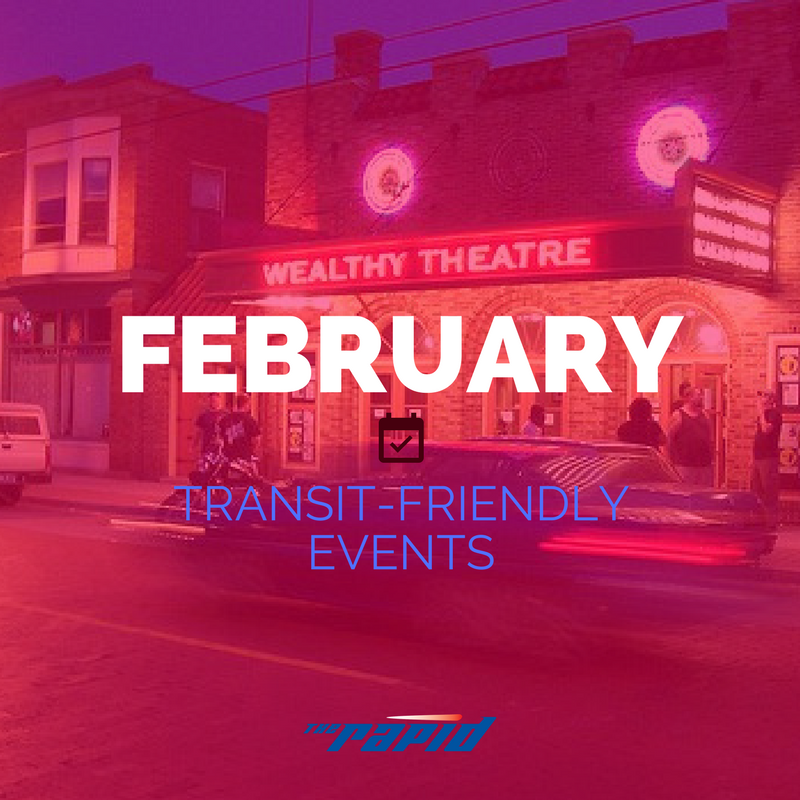 Visit the historic Wealthy Theatre on the first of every month. On Feb. 2, shop a wide variety of local vendors with everything from vintage clothing to self-care products. Some vendors to check out include Wild Pine Remedies, Solstice Handmade and Silver Moon Soaps. Admission is free! Ride Route 5 or 6 to get there. Visit the Grand Rapids Public Museum on Feb. 3 for the annual Ethnic Heritage Festival. This is a day-long celebration of music, dance, crafts and food representing the various ethnic groups that call West Michigan home. The City of Grand Rapids and the surrounding region have a long-standing history of diversity and various cultural traditions dating back from early explorers and fur traders, to modern day cultural rituals from new residents of the region. The event will begin at 10 a.m. and features a variety of organizations, performances, beer tastings and presentations. The Museum Café will feature ethnic food selections and a special International Beer Tasting. Event activities are included with general admission to the Museum. Routes 7, 9, 12 and 50 can get you near the Museum. On Feb. 8, visit Wealthy Theatre for a cinematic experience. The Ann Arbor Film Festival has been showcasing independent and experimental films since its launch in 1964. This year, Grand Rapids Public Library has teamed up with CinemaLab and the Wealthy Theatre to bring the 55th Ann Arbor Film Festival to Grand Rapids. These interesting and often challenging short films span many genres: experimental, documentary, animation, narrative and hybrids. A short discussion will follow the program. Admission is free and space is limited. Viewer discretion is advised. Not all Michigan animals are sleeping away the winter, ride with us to Blandford Nature Center to discover the animals who stay active in the winter wonderland. Get an up-close look at Blandford’s resident wildlife on Feb, 10 from 2-3 p.m. This program is $3 for Blandford members and $6 for non-members with $5 snowshoe rental fee. Register here. Ride Route 7 to visit Blandford Nature Center. The World of Winter Festival will be taking over Downtown Grand Rapids from Feb. 9 – 16! Downtown Grand Rapids Inc. and partners will be hosting a full slate of winter activities including the Human Hungry, Hungry Hippos Tournament, Snow Globe Experience, Love on ICE and Relax at Rosa on ICE. The 8-day festival is designed to take advantage of Michigan’s cold climate, provide fun ways for people to get outside and enjoy the season and make Grand Rapids a better winter city, which makes Grand Rapids a better year-round city. World of Winter comprises of a variety of free- and low-cost events that feature a wide variety of activities for both families and adults. View the full activity list here. Plan your trip using The Rapid’s Trip Planner tool. The Grand Rapids Boat Show will be featuring their broadest array of power boats ever…5 acres of them, especially for the Great Lakes! The array of motor yachts, cruisers, runabouts, fishing boats, and ski and wakeboard inboards is exceptional. This is your chance to board new boats and check them out! Admission for adults is $10, $4 for children 6-14. Feb 14-18. Purchase tickets here. Celebrate African American history and culture at Taste of Soul Sunday at the downtown Grand Rapids Public Library location on Sunday, Feb. 18. Listen, learn, eat, create, and preserve. Activities include a poetry workshop and crafts for kids. Enjoy food from IRIE Kitchen, Big Ed’s BBQ, Mosbyspopcorn and NoLos Soul! The Silver Line and Routes 4, 6, 14 and 15 can get you there. Grand Rapids is Beer City, USA and that’s due in large part to our nearly 80 breweries within 60 minutes of downtown Grand Rapids – and new ones are popping up all the time! We also pride ourselves on being a true foodie destination and were recently named the Best Food City in Michigan. During Cool Brews Hot Eats, experience the best of both worlds with food and beer pairing specials at many participating restaurant locations. Offered for an entire month (Feb. 15-March 15), there is no better time to enjoy food and beer! Participating locations and menus will be announced in early February.